Russell-Cotes Art Gallery & Museum approached the Art Detectives with several questions: Who is the artist? What nation do the flags belong to? Is this a real or imagined event? What date could be attached to the ships? The starting point was the Collection’s observation that the built-up bows on the ships were those seen in the years following the Napoleonic Wars. Very quickly the Art Detectives agreed that this was likely to be a post-Napoleonic scene. After a closer look at a high resolution version of the image, the Art Detectives recognised the ensign of the early nineteenth-century Portuguese navy. 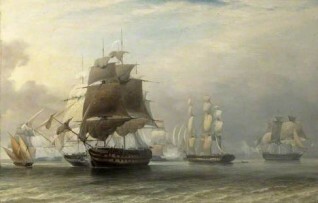 This led to the suggestion by Pieter van der Merwe that this picture represented ‘the (fourth) Battle of Cape St Vincent on 5 July 1833, between the small Portuguese frigate squadron commanded by the British Sir Charles Napier on behalf of their Regent Dom Pedro (acting for the rightful Queen Maria II) against the forces of the usurper Dom Miguel’. The current title could be explained by the fact that ‘this was the last action entirely between sailing warships (frigates being the key players on the winning side)’. To add weight to this theory, other representations were found of this scene, including one executed in 1842 by Antoine Leon Morel-Fatio, and another by an anonymous artist in a book by H. Noel Williams entitled ‘The Life and Letters of Admiral Sir Charles Napier’. Several suggestions were made with regard to an attribution, including John Christian Schetky, George Chambers, Antoine Leon Morel-Fatio and Auguste Musin. Antoine Leon Morel-Fatio became a likely candidate, but closer inspection of the painting is needed before this can be confirmed. As a result of this discussion the title has been changed to 'Admiral Charles Napier's action off Cape St Vincent, 5th July 1833'. The suggestions for a possible artist attribution have been noted by the collection to be investigated further at a later stage. Who painted 'The Last of the Sailing Frigates'? Does this work depict a real event?